For courses in problem solving and programming logic. Starting Out with Programming Logic and Design is a language-independent introductory programming book, teaching students programming concepts and logic without assuming any previous programming experience. Designed for beginners, the text is clear and approachable, making the complex concepts accessible to every student. In this new edition, Gaddis focuses on current languages providing code snippet examples and complete programs for each. The text uses updated, contemporary examples to familiarize students with models and logical thought processes used in programming without further complicating them with language syntax. By using easy-to-understand pseudocode, flowcharts, and other tools, Gaddis illustrates how to design the logic of programs. 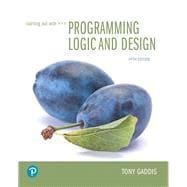 The book is ideal for a programming logic course taught as a precursor to a language-specific introductory programming course, or for the first part of an introductory programming course. Tony Gaddis is the principal author of the Starting Out With . . . series of textbooks. Tony has twenty years of experience teaching computer science courses, primarily at Haywood Community College. He is a highly acclaimed instructor who was previously selected as the North Carolina Community College “Teacher of the Year” and has received the Teaching Excellence award from the National Institute for Staff and Organizational Development. The Starting Out With . . . series includes introductory books covering Programming Logic and Design, C++, Java, Microsoft® Visual Basic, C#®, Python, App Inventor, and Alice, all published by Pearson.